These fantastical and playful toothy creatures offer a fun and modern approach to the timeless trapunto technique. Puffy applique has never been so huggable than with these things that go RAWR! These fantastical and playful toothy creatures offer a fun and modern approach to the timeless trapunto technique. Puffy appliqué has never been so huggable than with these things that go RAWR! 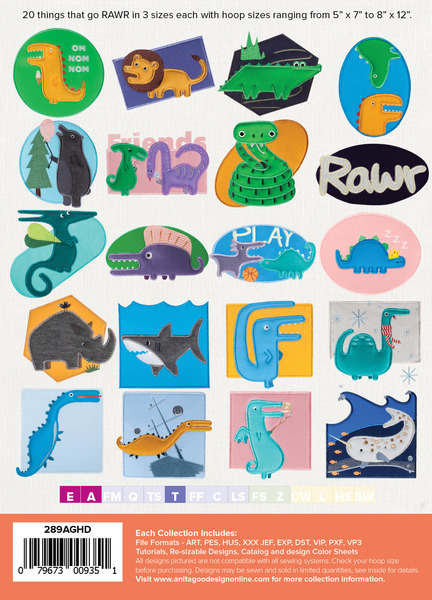 20 things that go RAWR in 3 sizes each with hoop sizes ranging from 5” x 7” to 8” x 12”. After we drew a few dinosaurs we said, “What else would boys like?” Everyone said sharks! So we drew some sharks and we said, “What else?” And we said stuff! We thought it had a nice ring to it. 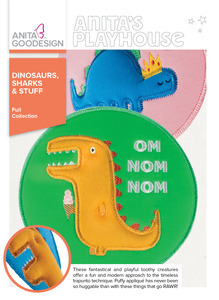 The “stuff” is other designs like monsters, narwhal’s, bears, and other animals. They were digitized using knits as appliqué and we even added puffy batting to them to make them pop! These designs are not just for kids - half of the people in our office made t-shirts for themselves!